In this 2009 paper published by December18 and written by Ms. Mariette Grange, the main features of the UN Migrant Workers Convention is examined in relation to the Middle East, and illustrates the use of the Convention to protect migrant workers in the States in the region that have ratified it – and even in States that have not ratified it when its provisions are invoked by independent investigation mechanisms. Six years since its publication, the analysis and conclusions provided in this paper still resonates today. As demonstrated in this paper, documented evidence of the type and extensive scope of violations routinely suffered by millions of migrants in the Middle East make corresponding provisions in the [UN Migrant Workers Convention] particularly relevant for the region. 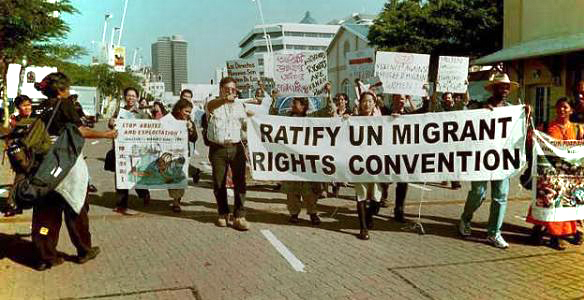 The treaty provides a unique catalogue of rights of a population rendered particularly vulnerable as it takes up employment away from home. This is a good introductory reading for everyone who is interested to learn more about the Convention and justification for ratification, written in clear, simple language. The statistics cited in the paper is understandably outdated, but the observations and recommendations are still currently relevant. Hardly any other part of the world includes countries where migrants outnumber the national population. The migration pattern generated by the Law of Return in Israel is also unique. Demographics are further affected by forced migration as the region hosts millions of refugees and internally displaced persons, some for over half a cen- tury, and others due to more recent conflicts. Last but not least, the Middle East is also a source of large numbers of emigrants to Europe and North America and experiments substantive intra-regional migration flows. . . . In many respects, the Middle East provides exemplary case studies that demonstrate why a specific human rights treaty to protect migrant workers and members of their families is necessary. Finally, a short section looks at challenges for ICRMW ratification in the region.